2016-17 Panini NBA Sticker Collection won't produce big values but the comprehensive set gives collector an early look at the new season for an affordable price. The sticker release highlights both top stars and incoming NBA rookies. Like past editions, the large base set is not exactly easy to put together but not quite as challenging as it seems. Among these are foil subsets that increase the yield for many top players. 2016-17 Panini NBA Sticker Collection totals 449 cards with around 100 special foil stickers. The checklist includes the current stars of the league alongside top 2015-16 rookies and the newest crop of players via the 2016 NBA Draft. 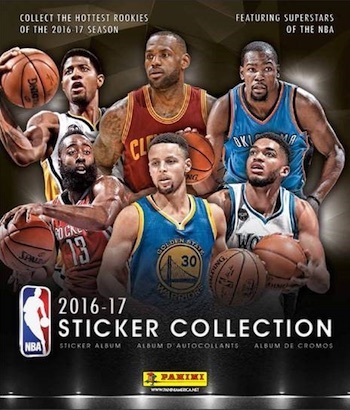 2016-17 Panini NBA Sticker Collection also offers a custom album that is sold separately. This 72-page storage book features two pages for each team and even more pages for notable events from the 2015-16 season such as the Christmas Day games, All-Star Game, playoffs and NBA Finals. In addition to a standard box format that includes seven-card packs and 50-pack boxes, the 2016-17 Panini NBA Sticker Collection Combo Display contains 150 packs along with 15 albums.